Juan Cole, a smart and well-intentioned U.S. university professor, has just printed an “Open Letter to the Left“, describing objections to the U.S. taking charge of Libya’s revolution against Gadaffi as “isolationism” and knee-jerk “enemy of my enemy” ideology. Admittedly, there are those on the Left who are unable to see outside first world struggles or understand that the US might be bombing assholes who are challenging the global hegemon out of desire to emulate them in their neocolonial adventures. I’ll wait a moment while you catch your breath from the shock of it all. But having had every left formation who could gather a dog and a Kinko’s card force on me copies of their “Libya statement” at last week’s Left Forum, Cole’s picture of the Left opposition, as his picture of the Libyan military situation, is not the result of dispassionate study. Overwhelmingly, Left-wing statements ( see the ISO or my own SP-USA as good examples) support the popular revolt in Libya, and support aid to the rebel forces. They have no illusions that Gadaffi is anything but a blood-soaked fascist. And left groups want sanction against his supporters and real grassroots aid for the popular revolution. We just know, as past history going back to the 1880s shows, that inviting the global imperial power to save them will enslave the Libyan people to a more subtle yoke in the coming years. This may be better than Gadaffi’s death squads, but that accepts the fallacy which goes completely unnoticed by Professor Cole that there are not simply two choices: domestic tyrant or Pax Imperia. As to one of his other objections, the only purpose in describing Americans as “Isolationist” is to equate them with the 1930s soft on Hitler American right. It is not isolationist to see one of the Western Left’s most important tasks as preventing their governments from invading foreign nations. Recent history screams that. 800,000 (or more) dead Iraqis and the mess in Afghanistan might have suggested U.S. led “coalitions” should be prevented from more adventures. Noting this is hardly the province of Left ideologues, and is anything but isolationist. Unless one believes America’s best interactions with the outside world come via General Dynamics. Or that Presidential elections which bring in a “nice guy” fundamentally change the motivations and use of power by the ruling classes of states. There is so much wrong with this piece, but I’ll try to limit myself to one overarching issue: Cole’s utter failure to accurately describe the objections leftists are making. We either buy Gadaffi’s ridiculous propaganda, think that the revolutionaries are controlled by the right (as a tiny handful of rather pathetic individuals on both the right and left seem to), or are “absolute pacifists.” Or we question the legal basis for war. Que? Since when does the left really care if there is a Security Council vote or not. Perhaps PoliSci professors are concerned with the formal legality, but we are dealing with questions of morality and outcomes. Nowhere are described the actual, sophisticated arguments being had: that air bombardments are militarily ineffective against ground forces, dangerous to civilians, and will come with long strings attached to the new government. A simple causality between the revolutionary offensive and US air-strikes is assumed in the first paragraph, even though there is little evidence apart from CNN talking points to support it suggests Cole has made up his mind about U.S. war-making based on emotion, not fact. Surprising as it might be, there are ways to support people struggling for freedom that do not involve a United States invasion. Again, Iraqis might have taught us this. This strikes me like hearing a little boy rationalize the loss of a beloved pet with ‘Doggie Heaven’. It’s understandable, but it’s fiction designed to make the speaker feel better about the brutal realities from which he’s suffering. States don’t go to war because of laws or treaties or UN resolutions. They go to war because of interest, and they carry out those wars in a manner and to ends in line with past experience and the interests of the actors. All reporting has shown that UN Resolution 1973 was written to the specifications of the U.S. government, and that was dictated by the doctrines of the U.S. military and the objectives of U.S. political leaders. Law and UN Charters are always a fig leaf, and believing otherwise is to conflate process with motivation. There are many Libyans calling for United States military involvement as well, and they are perhaps more easily forgiven for demanding immediate action from whomever is offering without examining who will deliver them what and why. But it is incumbent upon those outside and within Libya to explain just what that involvement will bring, and what it won’t. The U.S. military is not there to fight the war for them. It will not simply show up and shoot down fighter jets. In fact, U.S. military doctrine is very clear. They have first destroyed everything that looks like a missile site in the the coastal region, and attacked most airbases. The U.S. will then patrol the nation from 30,000 feet, and shoot down Libyan fighter jets. Those are major psychological weapons of the Gadaffi regime, but most had already been captured or destroyed. The real bloodbath was coming from 1942 style soviet rocket trucks, armored personnel carriers, mortars, snipers, and militiamen with rifles. The U.S. and its coalition are neither willing nor — as proved from the survival of Serbian heavy weapons after two months of U.S. air bombardment in the Kosovar War — able to destroy such forces from the air. The more likely outcome would be that of 1991 in Iraq: the U.S. circles above while the dictator massacres his citizens on the ground. The nation is divided, sanctions ensue, and the world has yet another open sore. Control over important oil fields, though, are maintained by the revolution, and the exploitation of these fields quickly passes from now dissolved state companies to large corporations. The terms of engagement have also been set similar to those so ineffective in Afghanistan. To meet UN 1973’s second mandate, individual jet pilots will be given the discretion to intervene when they see citizens being attacked. Which they will see how from that far up? And let’s just say that discerning friendly civilian militia from hostile civilian militia might be difficult from that distance should individual pilots really choose to act on that mandate. Cole’s argument also accepts at face value the breathless reporting of Gadaffi’s superior military rolling over Benghazi’s defenses. In fact, those forces still loyal to Gadaffi appeared at the beginning of U.S. involvement to number less that 10,000, and despite recent offenses to be both stretched beyond their means and operating in a society that will turn on them the moment they leave town. In fact, Gadaffi’s regime has since the 1980s starved his military of training, provided heavy weapons mostly for propaganda value and self-aggrandizing gifting to foreign partners, and set all units in competition with one another. There is no unified command, even in the six “regime support” elite units, and no units are allowed training in combined operations, for fear it may be turned against the government. Apart from entirely untrained thugs of the Revolutionary Committees militias, there are only six operating Brigade strength units fighting for Gadaffi. These internal security units are understrength, under trained, and still dispersed across the country for fear of new risings. Like the popular forces earlier failed advance westward on Syrte, the one and one half Brigades of paramilitary units advancing toward the east were unsupplied and overstretched. Even these elite units witnessed two company level defections (one armor company included) in the days prior to the US air-strikes. These are the causal relationships at play, not US bombing of Tripoli or antiaircraft emplacements. But Cole ignores all this. 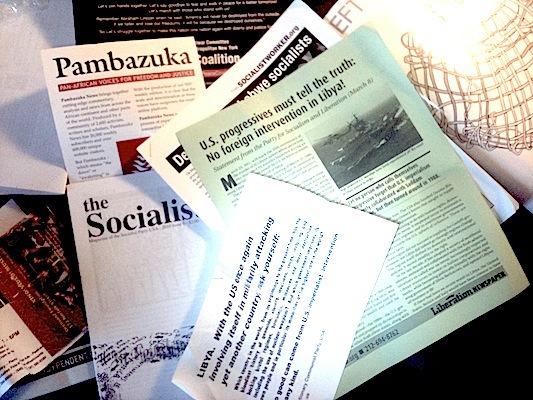 Some flyers I picked up at the Left Forum last weekend, a Leftist “gathering of the tribes.” They show unifed opposition to U.S. involvement combined with broad support for the revolution against Gadaffi. Little of Cole’s description of Leftist rehtoric on Libya is in evidence. Only the most crude sub-RCP-esqe objections are (far too easily) taken on by Cole, along with those of absolute pacifism. [note: After reading the RCP statement, an organization I deride perhaps more than I should for their sometimes inane rhetoric, I’m struck how they keep opposition to U.S. Imperialism OUT of their view of the Libyan regime, which they do NOT defend. Apologies to the RCP et. al.] This straw-man creation belies the “let’s have a civil debate” introduction. Either Cole hasn’t bothered to read substantive left criticism, or is choosing not to engage it. Cole also ignores the PR boon Gadaffi has been handed by the re-enactment of the 1986 bombings. Such attacks offer no support to the revolution while reminding the world of Gadaffi’s sole claim to anti-imperialist legitimacy. While it is easy to parody the crude propaganda of such a bloody buffoon, demonstrations supporting him across West Africa and elsewhere have appeared only since the US strikes began. Marches in Conakry (where the U.S. backed President felt the need to defend Gadaffi) have been followed by large rallies in Niamey, Bamako, and Dakar. We may laugh, but the governments in each of these places have felt the need to ban such gatherings. Some are undoubtedly paid for, but why was he not able to buy such demonstrations of support over the last month? Note too that “the Guide” keeps giving his addresses from the MUSEUM he built to commemorate the 1986 attack. In front of a giant STATUE commemorating the 1986 attack. Should that not have awakened some inkling to Gadaffi’s desire to repaint this revolution into the guise of Ronald Reagan’s foreign policy? However misguided (pun intended) support for Gadaffi by PanAfricanists might be, it should not be dismissed. Outright Franco-UK-US involvement has placed Gadaffi in the position he has wanted since the popular rising of his own people began. We may regret the purpose we give his defenders, especially when we think of the more subtle and effective support we — and Libya’s neighbors — might have given his people in this fight. We are only beginning to learn both the real weakness of Gadaffi’s oppressive state and the real price the Libyan National Council (led by men who were regime stalwarts a month ago) may have promised the west for this destructive airshow. If professor Cole really wants to engage the Left, he will reflect on what the Libyan people will still be paying off in “anti-Islamist security structures” and sweetheart oil deals in the years to come. Perhaps Cole was conflating the Left with this moronic screed that has been making the email and Facebook rounds of late? How anyone actually in Africa can look at the crap Gadaffi has stirred (Sierra Leone’s RUF for example) and how much African blood he’s spilled and buy this tripe is beyond me. Credit and demerit where due, there are a handful of foreign defenses of Gadaffi out there, but they are more likely to come from the right than the left. In fact, all the “usual suspects” of Tea Party racist Islamophobes are burning up with opposition to “Obama’s support for his Al Qaeda brothers”. Here’s a taste, most from organizations much better funded than any Marxist might dream of. One wonders, then, why Cole feels the need to sock it to the Left? Warning, serious dumbfucks linked below. Here’s some news which might not have yet penetrated the U. S. establishment, and might go some way to describing how the Left can support both the popular revolution and oppose a U.S. military takeover. – Sa’adi Tabouli Brigade is in Syrte, with parts assigned to the 32AB and fighting in Agedabia. To read more about the regime use of military forces — in classic fascist fashion — as competitive agents not as effective fighting units, see especially these works. Note that I am NOT an Arab studies expert, but I did have the common sense to actually read up on the subject before I accepted what CNN was telling me about the working of the Gadaffi regime. SWJ Foltz. “Libya’s Military Power,” Chapt 4 in René Lemarchand (ed) The Green and the Black: Qadhafi’s Policies in Africa. Bloomington (1988). This is especially good, if dated, on the weird logic of an untrained and atomized military provided with huge amount of heavy armaments which they do not know how to use. Much of the failure in Chad is ascribed to this, as is the importance of the six “Central Support” Battalions (which range up to Brigade strength). These too are kept at each others throats, and apart from the officers of the Khamis and some others who are personally loyal to Gadaffi, untrained and barred from carrying out most maneuvers. Note that in the current rising prior to the US involvement, even some elements of these units had defected to the revolutionaries. Later works (like Mattes) suggest little has changed. These all suggest notions that Gadaffi could retake the east without outside help are very unlikely. Asteris Huliaras. “Qadhafi’s comeback: Libya and sub-Saharan Africa in the 1990s.” African Affairs, (2001) 100 (398): 5-25. Hussein Solomon and Gerrie Swart. “Libya’s foreign policy in flux” African Affairs, (July 2005) 104 (416): 469-492. The Western media for quite some time has utilised Gaddafi’s eccentricities to portray him as mad. In reflecting on how this war in Libya has progressed, I, however, have reason to doubt the sanity of some Western leaders. The war has been advanced by mainly three NATO nations, America, France and Britain. Obama, while bombing Libya has professed that this is not a “war”. With stunning linguistic gymnastics, the war has somersaulted from the feet first “war” to a head over heels “support” mission and merely an “intervention”. I must now conclude that if I dislike my neighbour and start throwing Molotov cocktails on his roof and stones into his windows, I am not at war with him, but in an effort to have him remove from the neighbourhood, I am involved in a support mission and have merely intervened across the fence into his property. Sounds like a defence, then once I run it, I would have provided the Judge a good reason to order a psychiatric examination. Sarkozy, for his part, is faced with a UN Resolution which prohibits the supply of arms to Libya. He then in seeking to enforce the UN Resolution supplies arms to the rebels, while professing to be upholding that UN Resolution. Candidate number two for mental status assessment. and that Cameron and Obama are of one mind. All three leaders are, of course, on a “humanitarian mission”. And to implement same, one drops bombs relentlessly on the Libyan people, who then come out in mass support of their leader and demand that the NATO bombing stops. But, as we know, Obama, Sarkozy and Cameron are all great humanitarians and thus they shall not relent from the humanitarian bombing for accomplishment of the noble humanitarian mission of removing the leader who over a million people want, while insisting that a leadership that no one ever heard of before – is installed in power to uphold the democratic wishes of the Libyan people. Who really needs to consult the psychiatrist, Gadaffi, Obama, Sarkozy, Cameron or the masses of Libyans who marched in Tripoli ( http://www.youtube.com/watch?v=JHVDIMP-l80)? P.S. I note now that you tube is busy, yet again, blocking the videos showing the size of the pro-Gadaffi demonstrations. Of course, we have freedom of expression here in the West.